This week Princess Cruises announced that Captain Dino Sagani has been named Master of their next ship, Majestic Princess, which is under construction at Fincantieri and scheduled for delivery in April. Captain Sagani has been with Princess for 21 years. 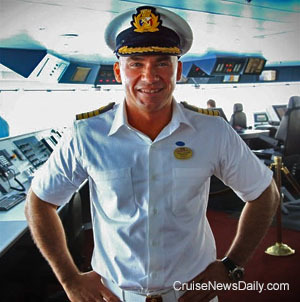 At the same time, Princess named Captain Craig Street as Majestic Princess’ Relief Captain. Details appeared in the February 6 edition of Cruise News Daily. 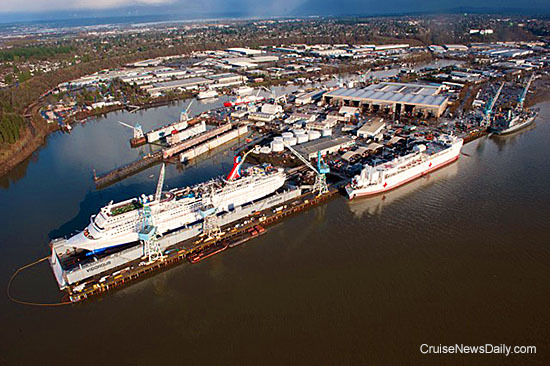 As we reported back in January, Carnival Inspiration began a three-week dry dock at the Vigor Shipyard in Portland, Oregon. During the time out of service, Carnival added many of their newer and most popular features to the ship. We took that as a vote of confidence that they intend to keep the Fantasy-class around for a while. One feature we didn’t mention at the time is that they are adding the ability of the ship to accept shore power while in port, a requirement in Californian ports. 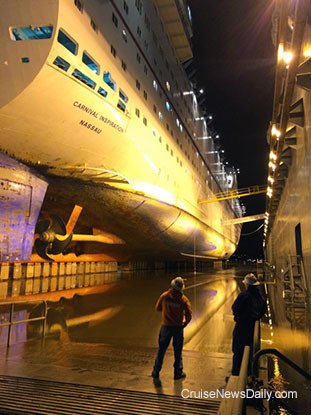 Carnival released some photos of the ship in dry dock which we thought were interesting and give us a look under the ship. The ship will return to service from Long Beach on Monday. Disney Fantasy experienced a propulsion problem that caused it to have to skip its port call at Castaway Cay this week. Repairs are underway. Carnival's American Table menus are still slowly rolling out across the fleet. Two more ships will be added in March. Details appeared in the February 5 edition of Cruise News Daily. Contrary to earlier plans and assumptions, the SS United States will not become a floating hotel or amusement center, permanently moored in some East Coast city. Plans now are to once again revive it as a cruise ship. With great fanfare, Crystal Cruises today announced they have an option to buy the classic liner and restore it to sailing status. They are currently beginning a feasability study which they plan to complete by the end of the year. It doesn’t fit with Carnival’s original vision of the brand. 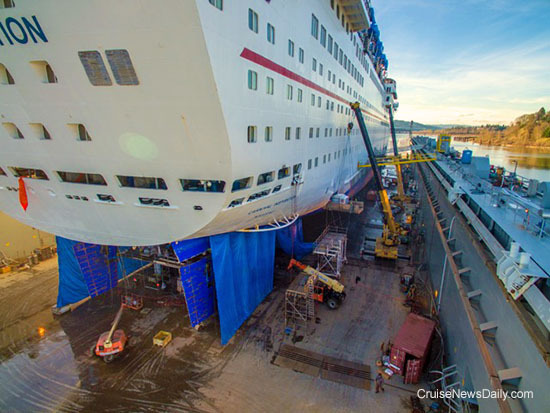 The complete story appeared in the February 3 edition of Cruise News Daily. The generosity of Holland America's passengers participating in "On Deck for the Cure" has reach $4.7 million. Royal Caribbean is extending their "no last-minute discount" policy. Details appeared in the February 3 edition of Cruise News Daily. Costa Cruises’ next generation of ships will have a new look inside, because the line has a new architectural visionary to lead the design process. Costa has appointed noted New York-based hospitality designer Adam Tihany as Creative Director for the two ships scheduled for delivery in 2019 and 2020. They are the next generation of Costa’s vessels. Last week, Carnival Cruise Line announced an initiative called “Honor, Family, Fun.” The purpose is to raise money for Operation Homefront and support military families through a series of special events. Operation Homefront is a national nonprofit organization that provides ongoing support to military families. The initiative works alongside Grammy-winning star Carrie Underwood. Ms. Underwood will also be joining the Carnival Live roster of artists in early 2017. MSC Cruises announced today they were exercising their options for two additional Meraviglia-class to be built by STX France. The two ships will not be exact duplicates of the Meraviglia-class. They will be larger and designated as Meraviglia-Plus. The announcement came at the STX yard in Saint-Nazaire during a coin ceremony for MSC Meraviglia. ISIS wanting to build a navy so they can attack large commercial ships, and cruise ships, with guided missiles. In response CLIA issued a statement that demonstrates they seem to be in touch only with yesterday's threats. Jamaica has its first confirmed case of the Zika virus. Mitsubishi reports the third fire this month aboard the nearly-complete AIDAprima. Arson is suspected.